MainBlogsWhere have All The Arabs Gone? 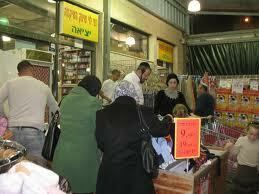 There was a time when Jews and Arabs shopped together in perfect harmony in Rami Levy and Yafiz, Sha'ar Binyamin. I'm not making this up. I've been working in Yafiz, Sha'ar Binyamin for almost five years. Not only did the locals Arabs shop, but their visitors would take pictures of each other with the Hebrew signs in the background very happily, just like tourists do all over the world. Going to Sha'ar Binyamin to shop for Arab tourists was like when I go to outlet malls and stores in the states. For the past few months there have been almost no Arab shoppers. Arab employees show up, because they do not want to risk losing their jobs. But we no longer see Arabs wheeling carts loaded with food, water, toilet paper etc, and even those Arabs who used to shop by us on a regular basis telling us that they can't find such good children's clothes in their shops haven't been in for a long time. There have been rumors that our former customers are afraid. Some say they are afraid of us, Israelis, but a friend who spoke to one said that the story is worse. You may not be all that surprised to hear that the Arab ( PA-Palestinian Authority) authorities have threatened Arabs who shop in Jewish stores. There are even roadblocks and inspections of cars that are suspected of coming from Jewish commercial areas. If merchandise from Jewish stores is found, it's confiscated/stolen by the inspectors. So that, apparently is the reason even our formerly best customers no longer shop with us.